The year is 1962 and Roadtrip-'62 ™ is leaving Hartford, Connecticut today, pressing on with our fifth day of travel along historic US-6. In 1962 it ran from Provincetown, Massachusetts to Long Beach, California and was the longest US-numbered route, 3,517 miles from ocean to ocean. Today it’s only 3,205 miles. Don Milne here, your virtual tourguide, and it’s always 1962 when we’re on the road. In case you’re just tuning in, the rules of the road here are to try to see what’s left from 1962. We will drive on US-6 as it was in 1962, try to eat only at restaurants that existed in 1962, try to stay only at motels that existed in 1962, try to buy gas and sundries, see only attractions and generally live in America as it was in 1962! To keep the journey focused, we will only see sights within 5 miles of US-6. And, we won’t be on freeways very much. There weren’t many freeways in 1962, as the country had just begun building the Interstate system. If you see anything you like, get yourself out on the road and enjoy it in person. This virtual roadtrip may be fun, but there's nothing like the real thing! At any time, click on an underlined word below to learn more about the places on the trip. Time for me to grab the wheel and go! I just realized I need to pick up the pace. In our first 4 days, we’ve only averaged 54 miles per day. At that rate, it will take forever to reach Nebraska, let alone Nevada! So let’s see what I can do now that we’re about to leave the historically dense Colonial area. For starters, I’m going to skip the Connecticut State Capitol. We just saw a state capitol in Rhode Island and we’ll have chances to see several more as US-6 passes through Des Moines, Iowa; Omaha, Nebraska; and Denver, Colorado. Looks like I was wrong a couple of days ago when I mentioned we don’t go through capitols very often. Instead, I’m going to visit the Wadsworth Atheneum Museum of Art. It closed yesterday at 5pm, so I don’t have time to see it then. The Wadsworth is the oldest public art museum in the United States, founded in 1842 by Daniel Wadsworth. In part because of this early start, the collection has items from all over the world and time. It houses American colonial furniture and decorative arts, the Samuel Colt firearms collection, and costumes and textiles in addition to the fine arts. Today the Wadsworth is five connected buildings, with the newest opened in 1969. Up until 1964, besides being an art museum, it housed some other institutions including the Connecticut Historical Society, the Hartford Public Library, and the Natural History Society. If you would rather see something other than art, you might want to substitute the Old State House or the Connecticut Historical Society Museum. Before I leave town, let’s stop to pick up some supplies. Polar Beverages is part of Hartford, Connecticut history because at one time in the company’s history, Polar’s products were bottled here. 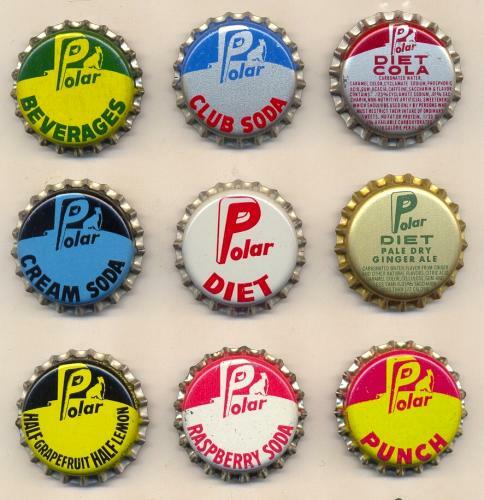 They were founded elsewhere in New England and have been producing soft drinks since 1882 so we could have bought Polar just about anywhere on these first several days of our US-6 trip in 1962. They began as J. G. Bieberbach Company and are now a fourth-generation, family-owned business. They also distribute Snapple (one of my favorite beverages) in New England. Today, they have an interesting roster of soda pop flavors you don’t find everywhere, such as Birch Beer, Orange Dry, Pineapple, Raspberry Lime, and two different flavors of Ginger Ale. Polar has been bottling seltzers since their start and that helped see them through Prohibition. Again, they have some interesting flavors such as Blueberry Seltzer, Orange Vanilla Seltzer, and Triple Berry Seltzer. I think I’ll stock up on several different ones for the cooler. Leaving West Hartford, I need to head due south to pick up old US-6 again in Elmwood, Connecticut. While today US-6 runs together with the I-84 freeway from Hartford to the New Britain area, the old road is still nearby and can be driven by roadtrip warriors such as ourselves. But it will take an old map and probably some U-turns to make it work. Part of US-6 from Hartford to Southbury, approximately follows the old East Middle Turnpike, a toll-gated coach road established in 1803 and turned over to the public by 1839. Our next stop from 1962 is the Hill-Stead Museum in Farmington, Connecticut. This museum has been here since 1947 and is a National Historic Landmark. A guided tour of the grand Colonial Revival mansion wanders through rooms filled with art and antiques, exhibited in situ. Besides paintings by Claude Monet, Mary Cassatt and James McNeill Whistler, the collection includes ceramics, furniture, and 10 buildings. These buildings, on the 152-acre property, feature a carriage barn and theater, stone garages, dairy complex, and even an adjacent Sunken Garden designed by Beatrix Farrand. You may also see plein air painting groups as you wander the grounds. If you’re interested instead in something a little further back in time, you might try the nearby Stanley-Whitman Museum, here since the 1930s. This museum features life as the early settlers lived it, in and around a 1720s National Historic Landmark house. Just when you may have thought we’ve seen enough carousels during the past few days, along comes the New England Carousel Museum in Bristol, Connecticut. Actually, I have seen enough and besides, the museum was only opened in 1990, so we’ll drive by. Interestingly, the museum provides restoration services for some of the other carousels we have seen, including the Looff Carousel in East Providence and the Bushnell Park Carousel in Hartford. Something we could have seen in 1962 is the American Watch & Clock Museum, so let’s stop in. The museum is 60 years old this year and its mission is to promote the history of American-made clocks and watches. Bristol businessmen formed the museum because the city was a center of clock manufacturing. They have 1,500 clocks and watches on display, all American-made. The museum pieces include advertising clocks, punch clocks, grandfather clocks, and, railroad clocks. Many of the timepieces were produced in Connecticut, some by the Seth Thomas Clock Company of nearby Thomaston. Seth Thomas was considered the "Tiffany’s" of Connecticut clock manufacturers and we could have purchased their clocks in 1962. In the quest for low costs, production was moved to Norcross, Georgia in 1982 and the firm went bankrupt in 2001. Just one of many products from our favorite year that you can’t buy anymore. If we had a whole afternoon to spend, I’d stop at Lake Compounce amusement park, also in Bristol, Connecticut. It’s the oldest operating amusement park in the United States, here since 1846. It began life as a quiet picnic park and was mostly used for picnics, rowing on the lake, and hiking through the post-Civil War era. As was typical of the 1890s, it was connected to trolley lines from the major cities and a casino building and rides were then constructed. One old wooden roller coaster, the Wildcat built in 1927 by the Philadelphia Toboggan Company, is still in operation. In 1959, an 18-hole miniature golf course was added and in 1962, speedboats replaced the leisurely paddling around the lake! It now includes a waterpark and dozens of new rides build during the past 20 years. As good as this sounds, I’m going to pass it by because I intend to stop at my favorite amusement park later in the trip, Cedar Point in Ohio. I’m going to put off lunch for awhile because there’s someplace special ahead. For now, a snack will have to do and in 1962, that often meant a candy bar. There were no "power bars", granola bars, protein bars, or the like back then, just old-fashioned sugar and chocolate, sometimes with peanuts. One of my favorites with peanuts is a Payday bar, which was made by Hollywood Candy Company then and is now a Hershey product. Glad I bought some this morning. Now that we’re out in rural Connecticut, let’s enjoy it with a hike at Black Rock State Park in Reynolds, Connecticut. It’s been a park since 1926 when a citizen's conservation group donated the land to the state. The park is also adjacent to the to the largest portion of the Mattatuck State Forest, so we have a large area to explore. As with thousands of the country’s parks, trees were replanted and facilities were developed by the Civilian Conservation Corps during the 1930s. The main hiking trail is the Mattatuck Trail, which passes through on its way from Waterbury to the Wigwam Reservoir in Morris, Connecticut. There are many side trails where one can see Black Rock Lake and the mature forests of the park situated on rock ledges. Even if you don’t want to hike, US-6 passes right through the State Forest. I’ll see you back at the car in an hour or two. If you would rather play a round of golf than hike, stop instead at Crestbrook Park Golf Course in Watertown, Connecticut. The course was opened in 1962 as a 9-hole private club, so you would have needed an invite to play. But it was purchased by the town in 1975 and they added a second 9 holes in 1980. This now-public course also includes a swimming pool and tennis courts. After the hike, the first thing to do in Woodbury, Connecticut is to find lunch! In keeping with the Colonial history of the area, I’m going to the Curtis House Inn, Connecticut’s oldest public inn. Continuously operating as an inn since 1754, they’ve been offering lunch, dinner, and lodging. Let’s look at the menu, which is the same for one of their quaint dining rooms or the cozy pub. Well, it’s a three-course lunch of regional Yankee fare, beginning with the soup du jour or a salad with house-made dressing. Then you can choose from pot pie, Yankee pot roast, English style fish and chips, chicken Marsala, crispy oysters, and several specialty pastas. Or you can choose from many sandwiches including a half-pound Angus burger or even a lobster salad club! My wife and I love a good pot roast, so that’s for me. And finally, a choice of desserts baked right on the premises. One note of caution, some online reviews and one of my readers note that renting a room overnight at the inn portion of Curtis House is not a good idea. Woodbury, Connecticut is "The Antiques Capital of Connecticut." The town´s reputation began more than 50 years ago when local dealers established businesses in historic homes along Main Street. So, even in 1962 we could have hunted for antiques. (Hmmm, were antiques older 50 years ago, or newer?) Today, Woodbury has over 30 professional dealers to visit, mostly along a 3 mile stretch of US-6. Maybe we can find some artifacts from 1962! Let’s look for some 1962 postcards, a Seth Thomas clock from that year, Blenko glass, a Chatty Cathy doll, some mid-century modern furniture, or Russel Wright Stubenville ceramics. Surely we can find something we’ll take home! I’ve noticed that many of the museums along US-6 are older than museums in the midwest. That makes sense, as this area was settled over 100 years before the other, creating older things to preserve. The Glebe House Museum & Gertrude Jekyll Garden is typical of that idea, having been a museum since 1925. This house was also the birthplace of the Episcopal Church in the New World. Even though the museum has been here a long time, the garden has not. This garden of classic English style mixed border plantings, a planted stone terrace, and an intimate rose allee was planned by Gertrude Jekyll, widely considered the greatest gardener of the 20th century. It’s much smaller than many of the over 400 more elaborate of her designs in England and Europe, but it was not completed in the 1920s when the museum was opened. Indeed, the plans were only rediscovered in the late 1970s and it was then completed according to those original plans. Since the garden was not here in 1962 and we’ve seen several houses in the past couple of days, we’ll head on down the road instead of stopping. Traveling south to Southbury, Connecticut, we would have met back up with US-6 ALT that diverged from us back in Willimantic. Between there and here, US-6 ALT passed through Waterbury, Connecticut, where a tornado damaged more than 300 homes and buildings, destroying 70 of them, on May 25th 1962. Back in Southbury, just a few miles southeast of town is Southford Falls State Park. It was established as a state park in 1932 and contains scenic waterfalls at the southeast end on Eight Mile River, along with rapids, wetlands, a boardwalk, and exposed rock outcrops. The river was a source of waterpower and it appears to have been deepened for mills and a dam. One factory taking advantage of the waterpower was the Southford Paper Mill, which in addition to paper, made furniture, knives and ground corn for flour. It was eventually bought by the Diamond Match Company and used to manufacture cardboard for their matchboxes. This factory burned in 1920 and the land became a park shortly thereafter. Diamond Match is a brand you can still buy today that was around in 1962. The main plants were in Oswego, New York and Barberton, Ohio. Lumber for matches was shipped from Michigan by lake freighter and canal to the plants. Today, there are only four U.S. match manufacturers left, with Diamond Brands being the only one producing boxed wooden matchsticks. All other wooden matches sold here come from Japan, Sweden, or other countries. Something to think about when you light that next campfire or grill lunch on the road. Something unique to Southbury is Churaevka Village, better known as Russian Village. It was established in 1925 by Count Ilya Tolstoy (son of Leo Tolstoy), and George Grebenstchikoff, as an artistic community for Russians who had fled the Bolshevik Revolution in 1917. They had their own print shop and used it to maintain and disseminate Russian culture. Besides that building, which is still standing but is not used as a print shop, a chapel still exists which was largely funded by aviation pioneer Igor Sikorsky. In 1962, Danbury, Connecticut was still the site of the Great Danbury State Fair every October. The fair had its beginnings in 1821 as an agricultural fair, and was placed on an annual schedule in 1869. It was such a big event that all the area schools closed and each pupil was given a free ticket to the fair! It still had elements of an agricultural fair, but by this time it also incorporated a circus, carnival, race track and more. Annual attendance was as much as 400,000. Something that made the fairgrounds special was the collection of fiberglass figures of all sizes, topped by gigantic sculptures of Farmer John and Paul Bunyan. A beauty pageant crowned Marlene Patren as "Queen of the Great Danbury State Fair" in both 1961 and 1962. A great personal account of the fair from about our favorite year can be found at Marc Catone’s website. Unfortunately for us, the fair no longer exists. Within a few years after the 1974 death of the owner, John Leahy, the organization kind of fell apart. The rides, attractions and other equipment was auctioned off after the final season of 1981, with some of the fiberglass figures going to other amusement parks. The land was also sold, the buildings demolished, and in 1986 the Danbury Fair Mall was opened on the fairgrounds site. It is the second largest shopping mall in Connecticut. The mall has a modern reproduction carousel and for some time, photos of the Fair and original signs were displayed in the mall's food court. In Danbury, we meet two US routes, US-7 and US-202. We’ll travel along with US-202 into New York State tomorrow, and then again when we cross the Hudson River. Route US-202 runs parallel to the Atlantic Ocean coast from Maine to near Delaware, but further inland than US-1. It’s numbering is based on being the second child route of US-2 (hence 202) and if only the eastern segment of US-2 is considered, it one of just a few 3-digit US routes to be longer than their parent routes. Route US-7 is a short route, passing only through Connecticut, Massachusetts, and Vermont to end at the Canadian border. Dinnertime in Danbury tonight, and I think I’ll try a Duchess Restaurant. Duchess is a small chain operating only in Connecticut, that goes back at least 50 years, so it fits our period. The chain began in Bridgeport, Connecticut in 1956 as a hotdog stand. The original menu was burgers, hotdogs, French fries and milk shakes: typical for the times. Just to try to stay close to what we would still have found in 1962, let’s order one of their Classic Combos tonight. We can choose from the Big D Cheeseburger or Long Dog, and substitute a milk shake for the soft drink. Their slogan of "Fresh Food, Served Fast" says a lot and they back it up by hand-cutting and breading their chicken breasts and even the nuggets. The onion rings are also hand cut daily, the breads baked in their own bakery, and the soups made daily. Other choices that were open in 1962 and still are today are Capellaro's and the Stony Hill Inn. Both have a banquet hall for weddings, in case you want to get married along US-6! After dinner, I’m going to just drive around town and look for some of the historical markers in Danbury, many honoring sites from the American Revolution. Some were not here back in 1962, but some were. There are two markers commemorating a raid of Danbury, which became a hospital and supply base during the war. Because of this the British, led by General Tyron, raided Danbury on April 26–27, 1777. Three men died defending the town and the British burned nineteen houses, barns and other buildings, destroying many supplies. Another marker commemorates the ride of 16-year old Sybil Ludington, who during this raid rode through the enemy-infested countryside 30 miles to warn the militia at Putnam County, New York that the British were attacking Danbury. There is also a statue in the town square honoring the men from the area who died during the Civil War. The monument depicts a soldier atop a column, which is typical of the period it was erected. One of the newer plaques features a building that we could have seen in 1962. Between 1886 and 1970 the Danbury City Hall was at the site of the present library courtyard. A piece of that original wall remains to preserve the city’s historic heritage. For lodging tonight, it looks like one of those nights where ROADTRIP-'62 ™ will have a hard time finding an older motel in good condition. Wherever I end up though, I think I’ll settle in with a Polar club soda. And, it might be fun to tune into something that was on TV in 1962. How about "Sing Along With Mitch"? Looking back today, this was an unlikely show to have been a ratings smash, but it was. The show ran on NBC on Thursday nights at 10:00pm Eastern time, during the 1961-1964 seasons. The odd feature of the show was that it was basically a sing-along, showcasing mostly old songs. The singers were not even the popular singers of the day, though a few appeared, but a large male chorale under the name "Mitch Miller and the Gang." The music was all Mitch Miller’s distinctive arrangements. Previous to the show, Mitch Miller had been a largely behind-the-scenes band leader and musical arranger. The sing-along portion of the show actually featured a forerunner of karaoke, with lyrics displayed at the bottom of the TV screen along with a bouncing ball to keep you on rhythm! One of the singers in the chorale, Bob McGrath, later had a long career as one of the hosts of the PBS children’s television show "Sesame Street." In the video, Bob can be seen in the front of the railroad scene at the left, dancing with one of the "pretty girls." I’ll enjoy a Polar cream soda while I watch. Don’t mind the video quality: in 1962 most of our TV sets didn’t look much better!